In a medium pot, bring 4 cups of water to a rolling boil. Once it reaches a boil pour in the uncooked steel-cut oats. Stir with a spoon and reduce the heat to low.As the oats simmer on low, stir in the salt, cinnamon, ginger, nutmeg and cloves. Let the oats simmer until it is to your desired thickness (20-30 minutes).Once the oats have thickened sufficiently, turn off the heat and stir in the molasses. 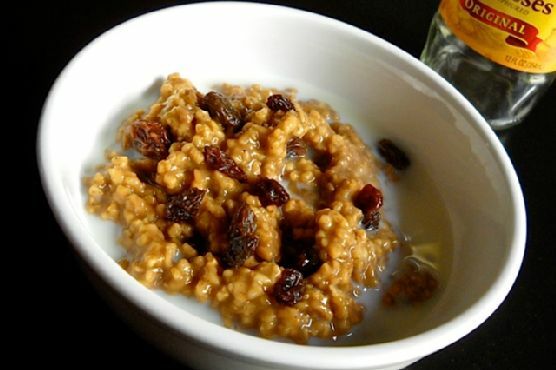 Place one cup of oats in a bowl and top with cup of raisins (or portion out all four cups into resealable containers, top with raisins and refrigerate for quick reheatable breakfasts later in the week). Cream Sherry, Moscato d'Asti, and Port are great choices for Gingerbread. A common wine pairing rule is to make sure your wine is sweeter than your food. Delicate desserts go well with Moscato d'Asti, nutty desserts with cream sherry, and caramel or chocolate desserts pair well with port.